Beautiful villa with private swimming pool situated on a private road in the Montechoro area. 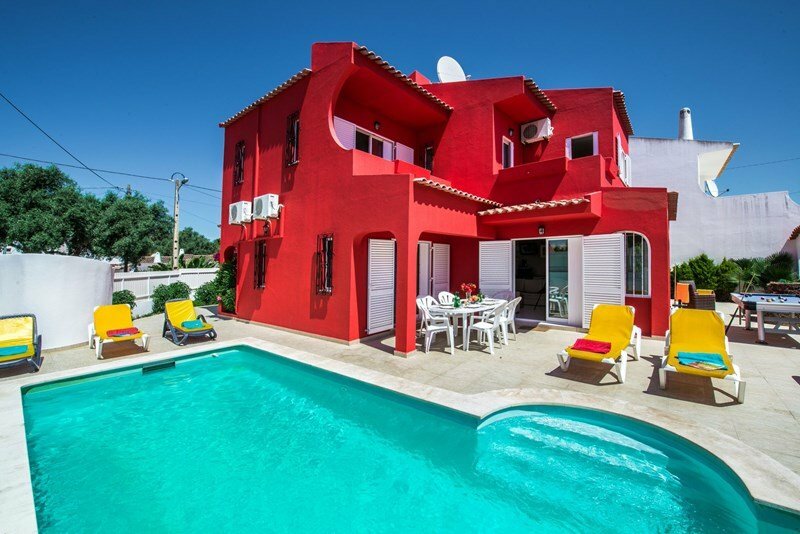 Short walk to the Old Town, strip and Oura Beach making it an ideal spot to relax and enjoy the sun. A beautiful spacious 6 bedroom villa with private swimming pool. From the outside, the Villa is fully fenced off for security and privacy. It is located on a quiet road with no through traffic, meaning you can enjoy a relaxing holiday, whilst being moments away from the Montechoro nightlife, beach, bars and restaurants. The Strip is only 10 minutes walk away and starts from the Montechoro Hotel and works its way down to Praia Da Oura Beach. You will find plenty of bars, restaurants and nightlife. If you are into your golf, there is a golf academy only 5 minutes walk away in Quinta dos Brejos, the Algarve Golf Academy has a driving range, putting green and the most complete practice area for short game. The academy also has a computerised equipment to evaluate the swing and the putt, and also a club house with restaurant, bar, terrace, golf shop and changing rooms. There is a lovely cafe across the road from the villa that will cater from a full breakfast, to a light snack. As you enter Villa Brejos you will be able to park one car in the Villa. Any other cars can park on the road with no restrictions. As you enter the gate you will find a good sized swimming pool with an outside dining area (in the shade) beside the pool. There are sun loungers surrounding the pool to enjoy the sun throughout the day. The outside shower facilities are on one side of the pool. At the rear of the property you will find the BBQ and clay stove for outside entertaining. The villa benefits from large mature pine trees and plenty of room to relax and enjoy the sun. There is a pool table is located beside the swimming pool. Once you enter the property you will find the living room with plenty of room for a group to sit down and enjoy the television, which provides English and European channels and a DVD player. There are sliding doors onto the pool and also an area to dine inside. Bedroom 1: 1st on right as you enter. Located beside the living room. Features double bed just next to house bathroom, with full air conditioning, and large sliding doors leading out to the pool area. Can add one extra single. Bedroom 2: 1st left as you enter. Twin bedroom with integrated sliding wardrobe, chest of drawers, side tables & en suite shower room. Air conditioning. Main bathroom: Located on the ground floor beside the kitchen, has large shower area, with modern fittings, completely retiled and has a modern theme. Air conditioning. Bedroom 3: Located on the ground floor leading off the living area, with twin beds, fitted wardrobes, air conditioning, French doors leading to the terrace and en suite shower facilities. 1st Floor: Bedroom 4: Beautiful double bedroom + 1 single with bath / shower and private terrace looking onto the pool, large room with large sliding wardrobes, chest of drawers and side tables. Air conditioning. Bedroom 6: 3 single beds with modern en suite shower room, large sliding wardrobe, private terrace looking onto the swimming pool, good size room with chest of drawers and side tables. Air conditioning. All bedrooms apart from bedroom 5 have full air conditioning as well as the living room. Kitchen: Lovely kitchen with marble worktop, a true Portuguese theme, whilst holding modern utilities. To the rear of the kitchen you will find the BBQ and clay oven. The kitchen opens up onto the living room providing an open social space. The interior has been tastefully decorated and designed with a homely holiday feel so you can relax and enjoy your holiday. The villas has been finished to a high standard and is excellently appointed. We can arrange for Wi-Fi for your stay. The cost for Wi-Fi is €15.00.